Stratta is a casually elegant restaurant located right at the edge of Wynn's restaurant row and overlooking the casino floor. You get to see all the table games and slots action while enjoying creative, delicious Italian fare. While it's a little more casual than the majority of the Wynn Las Vegas restaurants, it still lives up to all the quality and excellence you expect from the Wynn. 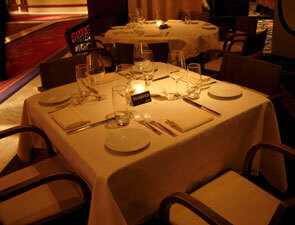 Stratta should be celebrated as a fun place to regale in traditional favorites and classic Italian cooking. If you'd like to know a little more in order to ensure the most pleasurable dining experience at Stratta, please read on. Reservations are optional. That said, reservations are always suggested if you don't want to be disappointed by not getting a table at the time you need it. Since Stratta is right on the casino floor it's a highly trafficked area and you might not be able to get in if you wait until the last minute. If you want one of the better tables, you would be advised to make a reservation. Seating is comfortable, and there are several options, from the curvilinear couches to more formal chairs. If you're seated in the lounge though, keep in mind that it is a casual lounge and there will be people at the bar. Tables are far enough apart that you're not on top of your neighbor. While it's nicely spaced, please do remember that you're in a casino, and there's bound to be the usual casino din. Stratta is probably not your first dining option if you want a quiet, romantic meal – its simply more dynamic and vibrant than that. The atmosphere in Stratta is casual and lively. You've got the flat-screen television at the bar and a view of the happenings of the casino while you dine, but don't worry about being too close to the action. If someone spills their drink in excitement at winning that elusive blackjack hand, or hitting the hard eight in craps, you won't get spilled on! Situated at the end of the theater row at the Wynn you'll also get to see everyone's smiling faces as they leave Le Reve, the spectacular Franco Dragone show, or Spamalot, Broadway's award winning musical that now plays at the Wynn. If you're not into either of those options, you can watch your food being prepared from the comfort of your own table, as the kitchen is open to the dining room. Either way, this is a fun, casual, inviting dining scene. The restrooms are located outside of the restaurant, but still relatively close, and on the same level. Complimentary valet parking is available at the hotel, as are multiple cabs. Keep in mind that if you're ending your meal at the same time as one of the shows (Le Reve, etc.) it will take a little longer to get your car or a taxi. We haven't seen any awards for Stratta yet, but we're sure that being in a Five Diamond Resort, Mobil Five Star Resort, and now a Five Red Pavillions resort, they are sure to come soon. Here is a sampling of Chef Alessandro Stratta's, and Alex's, accolades: Best American Chef - Southwest, James Beard Foundation 1998 while he was at Mary Elaine's; America's Top Hotel Chef from the James Beard Foundation; and another Mobil Five star award as Executive Chef of the resort. Alex has received a Michelin two star rating for 2008, the AAA Five Diamond Award of Excellence – 2006, 2007; Mobil Travel Five-Star Award 2007; "Best New Restaurants in America," Esquire magazine 2005; AAA Five Diamond Restaurant, 2006, one of only three in Las Vegas. A more comprehensive listing is in the listing for Alex.